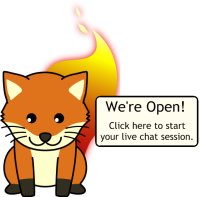 Today we are officially opening our Live Chat support to users of Firefox. Users who can’t find their answer in the knowledge base or the forum can now get real time help troubleshooting their issues with more skilled Firefox users. We’ve set 3 hours a day, Monday through Friday, when our current volunteers can commit to being online to take questions. As more people can commit to being around at other times, we’ll expand our hours. This is when we encourage new volunteers to help, but you may find someone available to help at other times — we just can’t promise it yet. You can be one of those Firefox experts! In order to provide 24/7 coverage so our users never have to see the “We’re Closed” Foxkeh, we need more Firefox helpers. You don’t need to be an advanced user, or have experience giving support to help out. Most of our helpers (and many of Mozilla’s community of developers) started out as Firefox users who had a question themselves. Many questions asked will already be covered in the knowledge base or the forum, and they either couldn’t find them or just need help going through the steps. Our software lets you talk to other helpers, and even invite someone else to help you give support if you get stumped. A good attitude and some patience is really all you need, and soon you’ll be an expert. Who knows, maybe you will end up being a Mozilla developer as well? A big thank you goes out to Lucy, the SUMO team, Nelson, morgamic of WebDev, and oremj, aravind & mrz of IT for making this happen! Thanks also to all the people who helped us test the software before the launch. Last but not least, to the community of helpers out there already available to help users of Firefox: without you guys, this effort would have been completely fruitless. You rock! What is the technology (system, application) behind this? Anything open-source? kjusupov, it’s powered by OpenFire which is a Jabber server and they’re using the FastPath module to route queries to contirbutors who are connected to the service. Please tell me they are not relying on the java plugin being installed and not causing hangs/crashes to be able to access this. If so, I hope it fails and fails quickly; maybe if a heap of Opera fanbois register as helpers and tell everyone with problems to install Opera instead. noJAVA: the web interface does not rely on Java. The client software for helpers/volunteers does, however. Bruce, this blog is not the place to ask for support. Go to http://support.mozilla.com. Is there a way to clear the add-on’s box? Cancelling & uninstalling them don’t work. I’ve even re-installed the software. Maybe there is a directory that needs to be cleaned out manually. I sure would appreciate some help on this! will not use Mozilla as much or at all any more. Is there any help available regarding this? I’ve tried 3 times in a row to get help with Livechat. The first time, I waited in the queue and the moment I reached the front I was cut off. The second time, the guy helping me asked me what the problem was. I explained the back button wasn’t working in Firefox and I couldn’t start Firefox in safe mode. He then left the conversation and Livechat told me the chat was over. Firefox livechat is just a joke! I am looking for a firefox specialist! I work for a recruitment company and we are desperatly looking for a firefox specialist. Unfortunartly firefox is not one of my expertise and i am looking for any advice. such as would someone specialise only in firefox? if not, what else would they do? how comman are firefox specialists? Can this realy work i mean nearly everyone uses firefox. Cant wait to see the outcome of the chat.